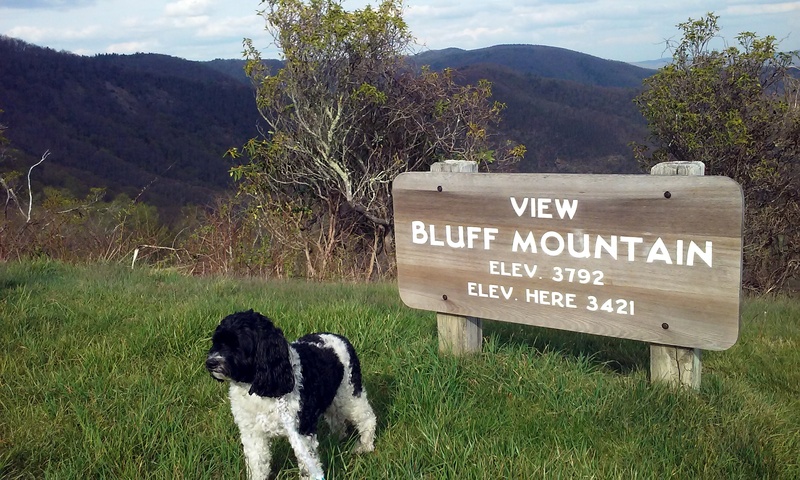 My penance (and your burden) for being an absent blogger over the past week or so is a longer post with extra graphics today. A lot of people, including me, are accustomed to assessing the overall skill level of a state’s or a region’s workforce (and thus its potential to capture growing industries that rely on more highly educated workers) based largely on the percentage of the workforce with a college degree. It is simple, intuitive, and more than a little lazy. It is also becoming a less useful indicator of the supply of labor that is in demand by businesses. Populations with higher levels of educational attainment confer a lot of benefits on a state or region but today, having a high percentage of a state’s or region’s population with at least a BA degree probably says as much about the state’s political and cultural sensibilities (as well is its “demand” for services rather than its “need” for services but that is another post) than it does about its economic performance and potential. The sense of self-satisfaction we in New England and in New Hampshire enjoy about having a population with among the highest levels of educational attainment in the country is palpable, but the reality is that more states are increasing their levels of educational attainment and New England and the Northeast stand-out far less than in the past. Moreover, in an economy that is increasingly rewarding particular skills and degrees more than just high educational attainment, it is not as clear that much of the region still has an edge on the one resource that it has that is always in demand – talent. Much of New England and the Northeast has a high percentage of its adult population with a four-year college degree or higher (see chart below). Just looking at levels of educational attainment tells only part of the story. I can’t blog for too long without talking about the “skills-gap” so here goes. Much of the demand for college-trained labor is in fields that require scientific, technical, engineering, or mathematical (STEM) skills and degrees. 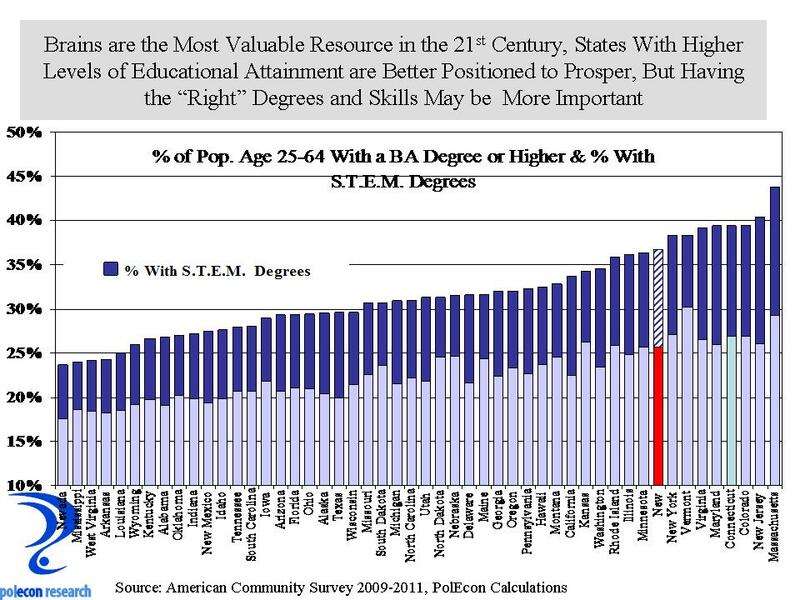 The percentage of a state’s population with a BA or higher degree tells a lot about the availability of STEM skills but for a number of states it tells a lot less. I calculated the percentage of a state’s population with a STEM degree (based on first college degree earned) and included it above as the dark blue portion of the bar graph. The official listing of STEM fields is maintained, surprisingly, by the Dept. of Homeland Security ( I categorized 171 college degrees into STEM and non-STEM degrees and I think my listing is close but not a perfect match). 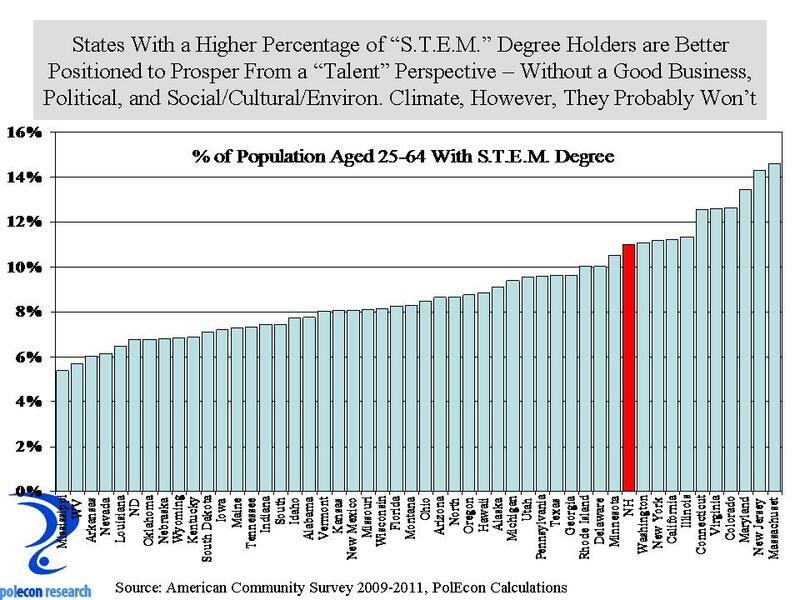 If you compare the percentage of the population with a four-year or higher STEM degree (chart below) with the percentage of the population with a BA degree or higher (chart above) it shows a large change in the relative rankings of a number of states, and a some in New England in particular. 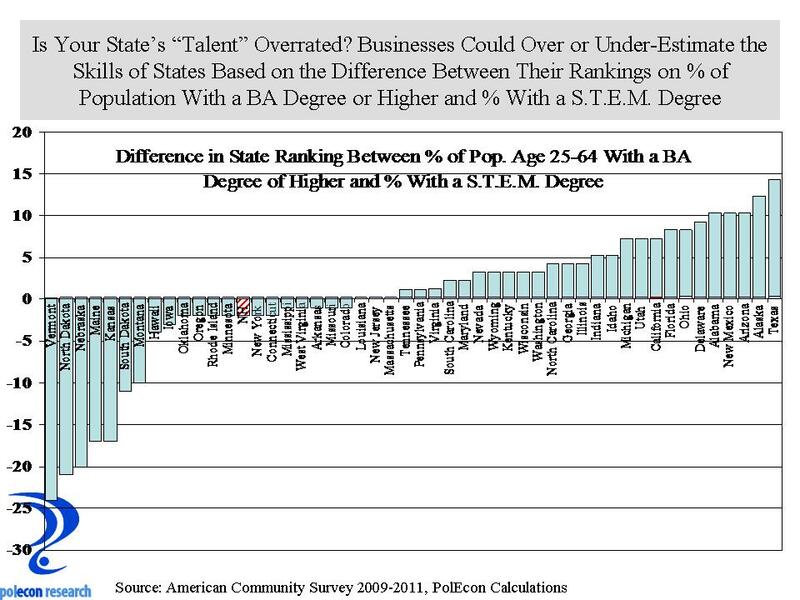 The final chart makes just that comparison, it shows the change in ranking between a state’s position on the percentage of its adult working population with at least a BA degree and the percentage of its population with a STEM degree. The chart highlights states that may be over and underrated on the skill level (at least skills in demand) of their workforce. Vermont stands out as having the biggest drop in rankings between the percentage of its population with at least a BA degree and its ranking on the percentage of the population with a STEM degree. Maine also fares poorly. But New Hampshire, Rhode Island, and Connecticut also drop in rankings when measuring “talent in-demand” among the workforce. Only Massachusetts does not drop in ranking ( it is ranked number one on both measures so there is no way it could show anything but a drop in relative rankings). On the other hand, states that are often derided by Northeastern “elites”, such as Texas, Arizona, Florida and Alabama have a smaller percentage of college-trained labor but more of them (on a percentage basis) are trained in the STEM fields most in demand. Still, they don’t have as high a percentage of their adult populations with a STEM degree as do some New England and some other states, but with population and migration trends, and as more individuals with those skills and more companies that want access to them agglomerate in those states, how long before some take the lead in “talent”? I don’t think Massachusetts has as much to worry about as do other states in New England because of their unique higher-education assets. 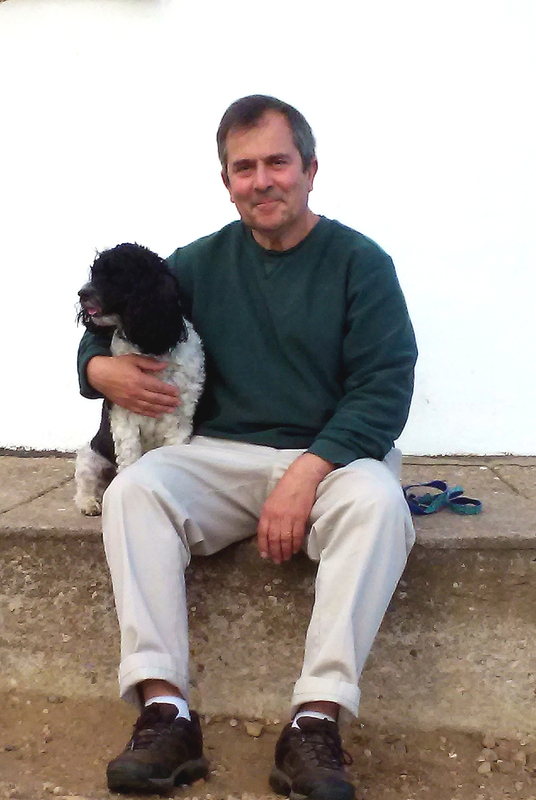 The question for the rest of us is, can we continue to “beggar our neighbor” and benefit from the Bay State’s ability to churn-out and attract individuals with the degrees and skills in demand? As New Jersey, New York, and Connecticut show, having a lot of “talent” in your workforce doesn’t guarantee strong economic growth. The business, political, environmental, and even cultural and social climates also play an important role in promoting prosperity. I look at states with a relatively higher percentage of their college trained workforces in STEM fields as “up-and-comers.” Most don’t have the history of high educational attainment in their populations that New England does, so their overall ranking on educational attainment tends to be lower. Some, like Texas and Arizona also have had a large influx of individuals with traditionally lower levels of educational attainment. Nevertheless, they are accumulating and growing a larger portion of the nation’s “talent” in STEM fields and over the long-haul, that is the biggest threat to New England’s most valuable and most in-demand resource, and thus the biggest threat to its prosperity. Unlike the federal government, states can’t easily budget and spend more money than they take in revenue so revenue estimates play a much more important role in state budgeting than they do in federal budgeting. I don’t know how anyone can accurately forecast revenues when the revenue yields are based on negotiations, lawsuits or other non-economic variables but that seems to be the basis of much of the disagreement among budget writers in New Hampshire. When a comparatively large percentage (compared to many other states) of your revenues are derived from a “Medicaid enhancement tax” and “tobacco settlement” money budget writing can become even more politicized than usual. I don’t pretend to know what these non-traditional sources of revenue will yield in the coming years but I get a sense that those who do are fitting their forecasts to their meet their budgetary goals. I don’t think revenue forecasting is that difficult as long it is based on real economic data and trends and it minimizes the use of assumptions about changes in the performance of the economy. I make forecasts with assumptions all the time but minimizing their use in revenue forecasts will mean that even if the forecast is wrong, it won’t appear as though the error resulted from a desire to “coax” a specific result from the forecast. 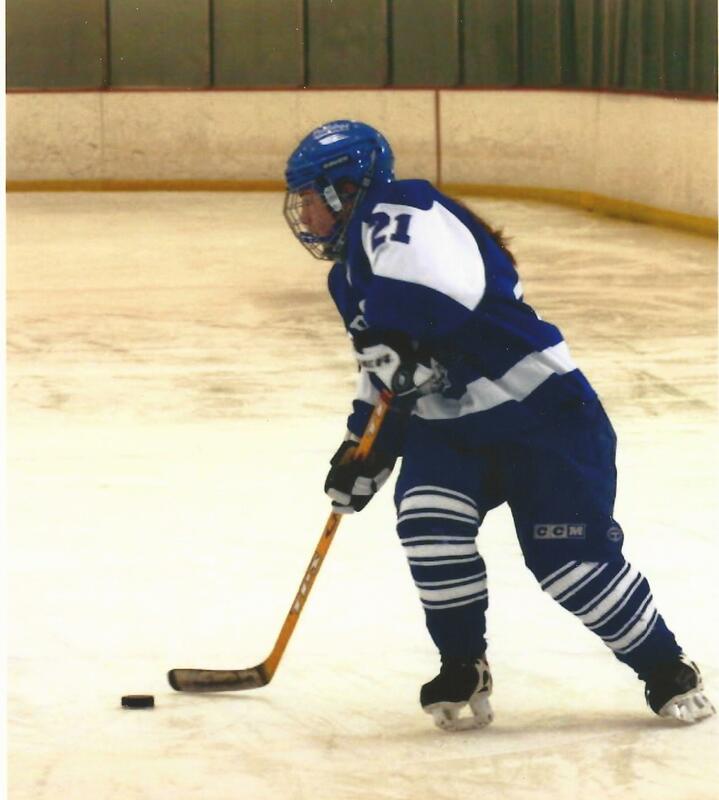 In January I presented my outlook to the NH House Committee on Ways Means. 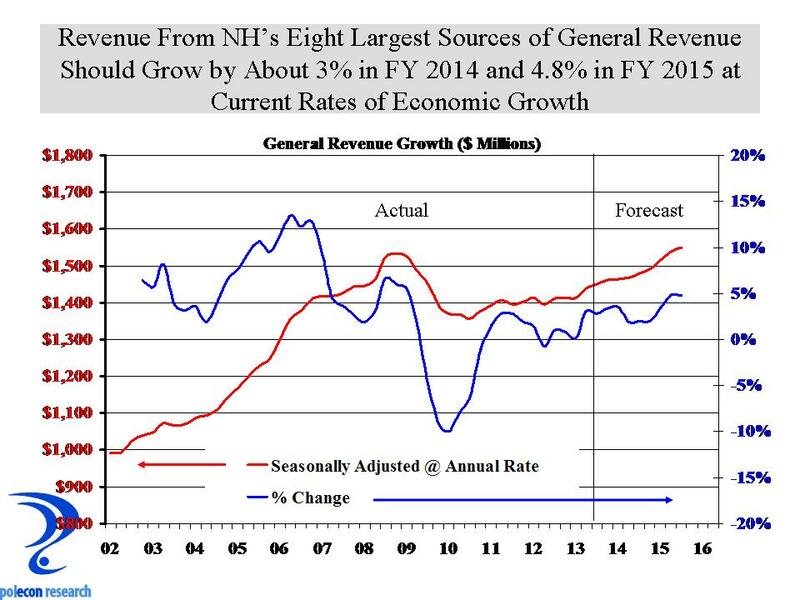 At that time I said I thought revenue growth from major, “own-source” revenues would average about 2% each year of the biennium and that businesses tax revenue growth would be a bit higher, but with even modest economic improvement could average 5-6% annual growth. Now, several months later, based on recent revenue performance, and making no assumptions about significant changes in economic conditions, I see growth at about 3% in FY 2014 from the eight largest sources of general revenue, and just under 5% in 2015. Those numbers don’t count the “non-traditional” revenue sources but I think they are important in reflecting the fundamental underlying growth in the state’s economy and a better assessment of general revenue trends. Clearing out some old boxes from my attic I came across a number of old college tests and papers. One was from a graduate school class on public finance where I argued that all federal budgeting and budgeting debates should proceed from a common economic and revenue forecast. I also found one from an undergraduate class on the philosophy of Marxism in which I wrote phrases like “man should never be a means to end but only an end in himself ” so clearly I was prone to a lot of bad and muddled thinking back then. In the 1990’s I wrote a column in a publication arguing for a non-partisan revenue estimating committee in NH. That was a pretty good idea and it did happen – although my prompt had nothing to do with it – and it was enacted largely absent the “non-partisan” aspect (or at least “unbiased”). I still think a true, non-partisan, representative revenue estimating panel would be a good thing for NH, not to bind any actions but simply to serve as a baseline scenario that any policymakers who wishes to deviate from would have to offer solid reasons for doing so. Some group in the budget debate has to serve as the “honest broker” but the honest broker role won’t happen if the group is loved too much by some or hated too passionately by others. The current estimating panel has some of the best and most qualified people I know to do revenue estimating . It just doesn’t have the credibility among many policymakers that it could have if no one loved or hated it too much, but instead almost everyone complained a little (or a lot) about it. It is too bad because we are still going to need an “honest broker” when the NH House and Senate begin negotiations on the next budget. First, let me start by noting that this is not a post about the merits of the Affordable Care Act (ACA), depending on your political leanings either pejoratively or admiringly labeled “Obamacare,” it is a post about policy analysis. I love public policy analysis and I tell almost everyone who asks me (there aren’t many) that to understand the full impacts of any proposal it is far more important to understand the incentives inherent in a policy proposal than it is to understand the goals, objectives or intentions of the proposal. Businesses, just like individuals, will respond to changes in public policies according to their self-interests. In the case of the ACA, businesses wishing to avoid providing health insurance coverage to some or all employees have an incentive to keep employment levels below the employment threshold at which the ACA applies to a business (50 employees) or reduce the number of full-time employees in order to fall below the threshold. In a prior post I noted that there was some early evidence of the effects of these incentives on retail employment (an industry with a higher percentage of workers without health insurance coverage) but that I thought more evidence was needed to evaluate any impacts from the ACA. At that time I suggested that the expiration of the payroll tax cut might be more responsible for declines in retail employment than any impacts from the ACA. I promised to follow the issue so here is some additional evidence and unfortunately it points to some negative employment impacts from the ACA. Whether this will continue and if it is does whether the negative impacts outweigh any positive impacts from the ACA is fodder for future posts. 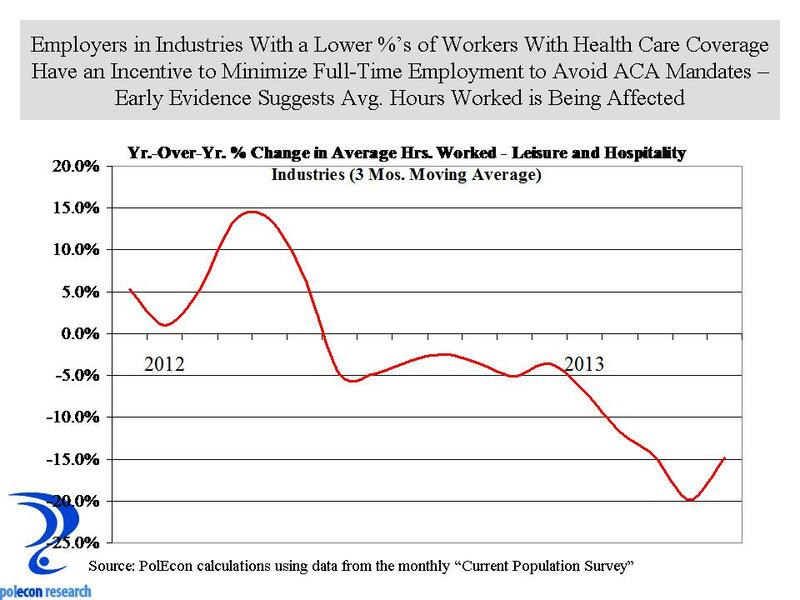 For now, the chart below shows how the average hours worked in the leisure and hospitality industry has been declining. This is an industry with the highest percentage of workers without health care coverage and also with a high percentage of employers near the threshold at which the ACA mandates apply. It is also an industry that employs large numbers of part-time workers, making it relatively easy for employers to reduce the hours worked by employees in order to have them fall below the criterion that would have them classified as full-time employees for purposes of ACA mandates. As the chart shows, the average weekly hours worked in the industry (compared to the same month of the prior year) has declined significantly since the end of 2012. It is still to0 early to make claims about negative employment impacts from the ACA but the evidence is beginning to point to some troubling impacts. As we move toward the implementation date for the ACA any employment impacts will become clearer as employers looking to avoid mandates get closer to finalizing the employment level averages that will be used to determine their inclusion or exemption from ACA mandates. Empirically it may be too early to make a definitive call on the ACA’s employment impacts, but based on what I see as the incentives inherent in the ACA, it is just a matter of time before the call gets made. There is a lot of discussion, debate, advocacy and lobbying about whether New England’s energy future is becoming more vulnerable because of the region’s increasing reliance on natural gas for electricity generation. Some see the prospect of rising natural gas prices (because of increasing demand in the region and nationally) as a vulnerability and others are concerned about constraints on the pipelines that bring natural gas into the region. I’ve posted a lot about natural gas and electricity related issues and as I have previously stated my belief that regional increases in demand along with greater U.S. production of natural gas are more likely than not to create scenarios that will increase the capacity of the regional pipeline infrastructure. New England has traditionally been a region with a relatively low percentage of its energy consumption in the form of natural gas. That is changing rapidly, but increases in U.S. production of natural gas along with demand driven incentives to increase infrastructure capacity in the region should reduce a lot of the volatility of natural gas prices in New England. 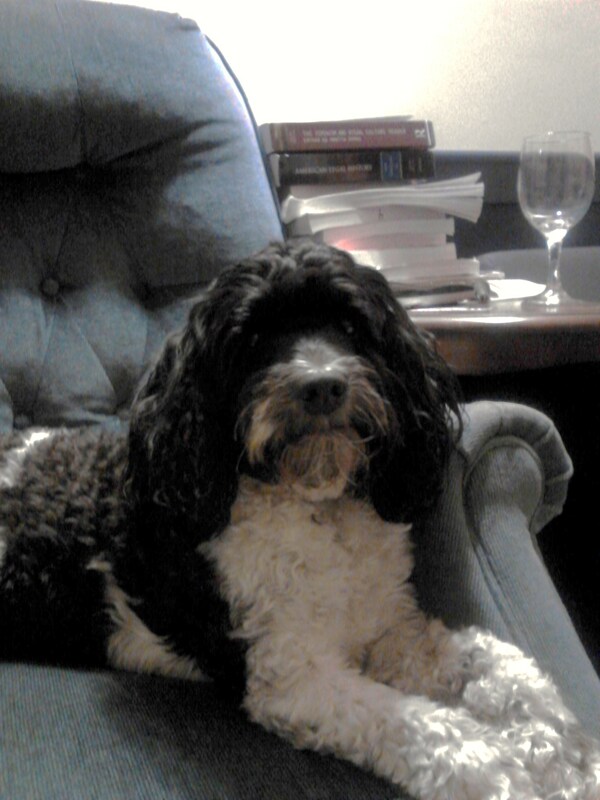 Apparently there are other folks who feel similarly. The U.S. Energy Information Agency (EIA) released its “Annual Energy Outlook” last month and it has a wealth of historical data, forecasts and projections. Their forecast of natural gas prices across the country are based on many economic, energy demand, production and other variables. They also produce a range of forecasts based on different assumptions about economic growth , energy demand and prices. 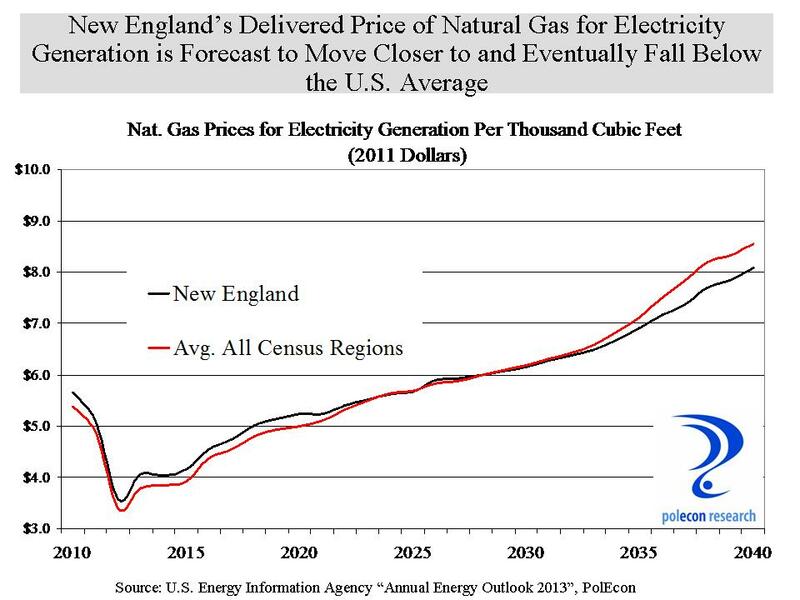 The good news is that their baseline forecast for natural gas prices in New England (chart below) shows that prices in the region, which are traditionally higher than in most other regions of the country, are expected to align with the national average early in the next decade, and then move lower than the national average over time. Even better news is that this forecast is not dependent on a much weaker economy in New England than in the rest of the country (which would imply lower increases in energy demand in the region compared to the rest of the country). I don’t think EIA would be forecasting lower relative prices in New England if they did not see region’s pipeline infrastructure issue as being addressed. The EIA also projects that the price of natural gas relative to coal will continue to increase. Coal will probably almost always be a cheaper fuel than natural gas but today’s typical “combined-cycle” natural gas generating facilities are much more efficient than coal-fired plants. When the ratio of natural gas prices to coal prices is approximately 1.5 or lower, a typical natural gas-fired combined-cycle plant has lower generating costs than a typical coal-fired plant. Natural gas-fired electricity generators enjoyed a strong competitive advantage over coal plants in 2012 but natural gas plants will begin to lose competitive advantage over time, as natural gas prices increase relative to coal prices. The retirement of older coal-fired generating plants, however, will mean that coal continues to generate a smaller percentage of the region’s and the nation’s electricity. Some see New England’s increased use of natural gas as a concern. There are issues that need to be addressed but none that are insurmountable or that should have the region reconsider its increasing reliance on natural gas. Long-range energy price forecasts are notoriously difficult but New England’s energy needs and interests are finally becoming more aligned with the rest of the nation. For too long New England has been an anomaly as the most oil-dependent and least natural gas-dependent region in the country. Personally, I would rather have 300 million people concerned about my energy needs than just 15 million. Annual budget deficits since 2009 have been the largest in a generation. The deficit-to-GDP ratio, which averaged 2.5% from 1980 to 2007, peaked at 10.1% in 2009 as the recession reduced tax revenue and spending rose with the economic stimulus package. There is still a long way to go but the deficit to GDP ratio has improved each year since 2009 and will likely continue to do so for the next few years. The chart below shows a reasonable proxy of the official federal deficit – it shows the 12-month moving average of the difference between federal revenues and federal spending. Over the past year this deficit estimate has improved by an average of $28-$30 billion per month, much better than the CBO’s 2013 deficit projections. The deficit is shrinking because of a combination of higher revenues and slower spending. To this point deficit reduction has largely been the result of higher tax revenue resulting from an improving economy, the expiration of the payroll tax holiday (worth about $135 billion this year), and higher tax rates for upper income individuals but spending reductions are beginning to play a larger role. 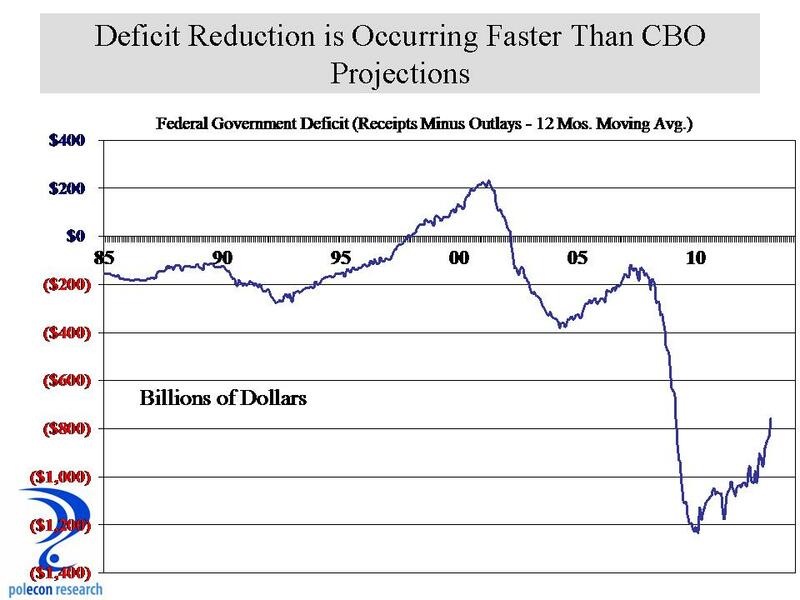 Lower deficits and a reduction in the national debt as a percentage of GDP will help economic activity in the long run. 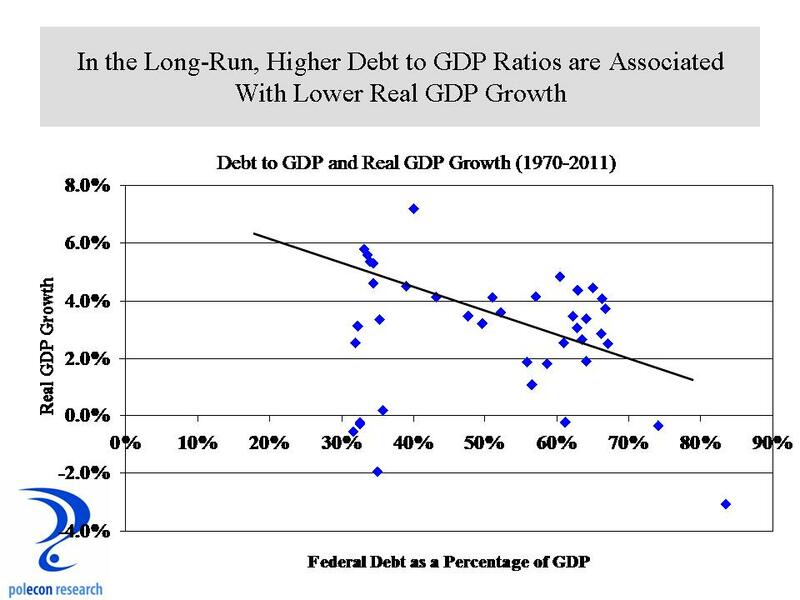 Although there are many short-term factors that influence the relationship between federal debt ratios and GDP growth, over the longer-term, higher debt levels are associated with slower GDP growth and lower debt levels are associated with higher GDP growth. The deficit is contracting faster than expected, but the goal of deficit reduction can have negative implications from either excessive taxation or spending cuts that significantly impact demand. The Federal government accounts for roughly 7% of total economic output and has shrunk by an average of about 10% each of the last two quarters. So while the good news is that deficit-reduction is likely to be greater than expectations in the near term, the cost from tax increases and spending cuts will likely lower real GDP growth by about 1% over the next year.